It’s time to open up Portage and Main. It is not right that Winnipeg’s most iconic intersection can only be experienced while driving through in a vehicle. Opening up Portage and Main is about more than an intersection - it’s about investing in the future and progressing as a world-class city. I’ve heard many times over the last several months that Winnipeg just ‘feels’ different these days. There’s an energy and excitement that you can feel throughout the city. We are no longer a punch line – we are turning heads, visitors are coming, and people want to know more about what is happening here. Part of that energy comes from recent investments our city has made. Major capital projects such as the Canadian Museum for Human Rights, Investors Group Field, Assiniboine Park, and The Forks – all of which also saw significant grassroots opposition – are now iconic parts of our city. These are not just buildings, they are a part of who we are as a city. They are iconic. These investments already started to generate a return. Winnipeg’s downtown is booming. According to CentreVenture, the city’s downtown population has increased by more than 17 per cent since 2001. The already-iconic True North Square, and the planned 40-storey residential tower at 300 Main are two of the best examples of validating our downtown growth, and increased demand for living space in the area. Being world-class means investing in Winnipeg in ways which will have a long-lasting impact. Consider last year’s Winnipeg Whiteout Street Parties – an event which transformed the way North America sees our city. Those events were not inexpensive, but the dividends Winnipeg earned are worth every single dollar. The pride we feel as a city, and the reputation we built, have established our city as an iconic and passionate metropolitan centre. Today, Winnipeg is a world-class city, and we’re continuing to earn that designation in new ways all the time. That’s the image we want to display – that we are leaders who can stand toe-to-toe with any other jurisdiction on the continent, and beyond. We want our city to be energetic, sustainable, well-designed, with a bustling downtown area. World-class cities spur new economic development, attract new jobs, and talent gravitates towards them. Ubisoft and Skip The Dishes are two examples of companies that have set up shop in the Exchange District – right in the heart of the action. Companies like these, and their employees, demand to work in cities that are connected and energetic, especially within the downtown area. It’s a recruitment tool, and an extension of their corporate culture. Contrasted against the growth of our downtown is the current civic debate on Portage and Main. There is no argument that the intersection needs to be refurbished, regardless of whether the barriers come down. However, the city will be spending money on this intersection no matter what it will end up looking like. I encourage Winnipeggers to want more than the status quo. If as a city we fail to move forward, we are going in reverse. The status quo is not world-class or iconic, and is out of step with what our city has become. The offices of Economic Development Winnipeg are located just beside this famous intersection. On a regular basis, our staff finds tourists, or even resident Winnipeggers, confused and lost trying to navigate the underground rotunda in order to simply cross the street. Our iconic intersection of Portage and Main should be a meeting place – a bridge between neighbourhoods, and a destination in its own right. 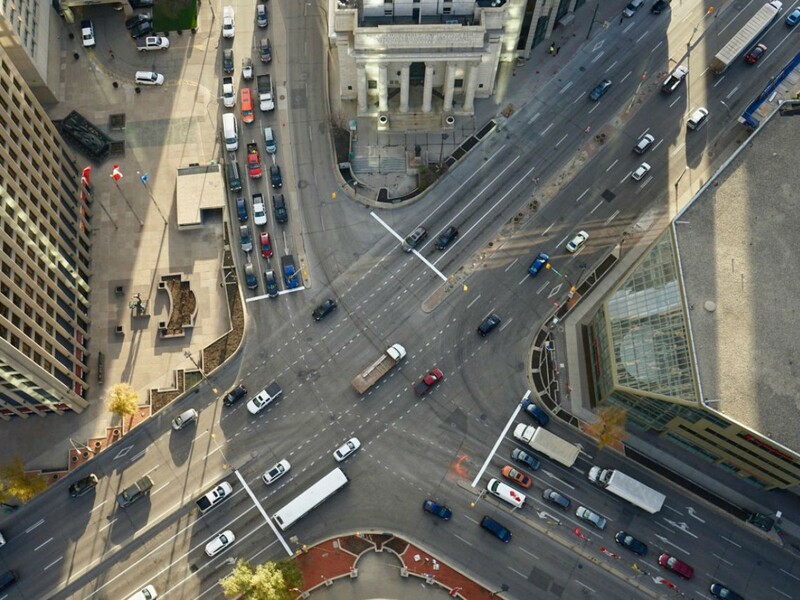 This requires us to imagine the potential of Portage and Main, as more than just an intersection. This single project is part of a larger, interconnected downtown environment. Bringing down the barriers and making this intersection more accessible is good for local businesses, good for keeping foot traffic flowing on the street, and good for economic growth. The investment we make in Portage and Main will pay dividends. There are virtually no examples in other world-class cities of another other major intersection like Portage and Main. On the contrary, iconic intersections around the globe, such as Yonge and Dundas in Toronto, Times Square in New York City, or Shibuya Crossing in Tokyo, all have open and safe pedestrian access which have allowed both tourism and business to thrive. Our downtown is growing at an unprecedented rate, both in terms of its economic output and physical footprint. The days of rolling up downtown sidewalks at 5:00pm have ended, replaced with a vibrant city centre filled with residents, cutting-edge restaurants, and world-class businesses. If we want to continue this growth, we need to plan our city’s infrastructure to accommodate it. To attract more companies like Ubisoft, or foster the growth of local companies like Skip The Dishes, our city needs to continue growing and evolving like other world-class cities. We need to invest in what is possible, because that investment comes with tangible returns for our city in terms of international reputation, economic growth, and civic pride. What made sense in the 1970s is not best practice in 2018. As we continue along the path of making Winnipeg world-class, we need to focus on the long-term vision of what we want our city to be and make planning decisions that will help us get there. We need to demand more, dream bigger, and invest in our city’s future.